From the Editor: This article first appeared on May 7, 2018, on Yevgeniya’s personal blog. It came to our attention at the Monitor after a Federationist shared it on her Facebook. Yevgeniya immigrated to the United States from Russia in 1999. 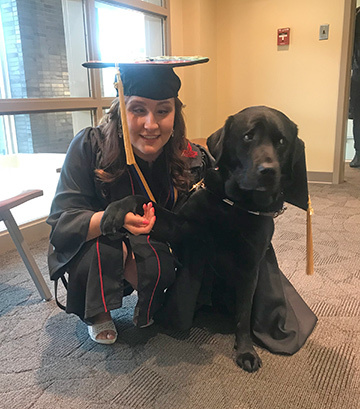 In 2014 she was the winner of a National Federation of the Blind national scholarship, and she recently earned a bachelor’s in social work with a minor in psychology from Bridgewater State University. 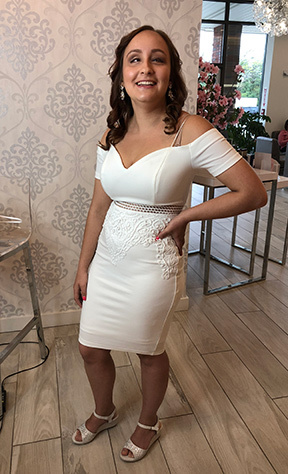 She has volunteered with a suicide prevention hotline and has done a social work internship in Boston doing case management with families to help eliminate moderate barriers such as childcare to help them achieve long-term financial and housing stability. She says that these experiences have taught her three things: that with the right level of support, anything is possible; to try to view your differences as strengths rather than setbacks; and that a positive attitude despite the obstacles that life throws at you will get you further than you think. For those of you who joke that some people on Tinder blindly swipe on everyone just to get matches, welcome to my world. Hundreds of matches might be a nice perk and amazing confidence boost, but I literally swipe right on everyone because I have no other choice. Before I go into this any further, I just want to say that no, physical appearance does not usually make or break a first date for me. At the same time, though, I am still human, which means that forming opinions is inevitable, despite my desire to keep an open mind. Personality is everything, but I still have to be physically attracted to a person to some degree to keep on dating him. Just because I am blind does not mean that I don’t have my own bedazzled picture of “dream boy” in my head, with his ability to sparkle in the sun and all. Don’t kill me—I’m only kidding. We’ll save my not-so-kind “Twilight” rant for another day. But on the more serious side of things, I envision my ideal man to be taller than me (not that that’s a hard one since I’m the height of an average person only when I wear heels), built and somewhat in shape, someone who dresses casual, but neat, among other things. On the other hand, I always strive to keep an open mind because I would want the same in return. So, even when a Tinder match doesn’t fit these qualities and doesn’t seem like someone I might connect with, I give them a shot. Doesn’t seem too difficult, right? I wish it was that easy. Although VoiceOver, the software that comes with every iPhone, allows me to listen and respond to my Tinder messages, it unfortunately doesn’t yet have the capability to objectively describe pictures in such detail that would allow me to form my own opinion about a person. Even if basic descriptions were made available, the subjective qualities that often determine the direction of the swipe for someone who can see would be too controversial in nature to be universally accepted as a description by the public. Let me explain. We can all agree on the fact that everyone has a nose. Therefore, if the description were to be that simple, it wouldn’t mean much to you if you closed your eyes. Now, say you get a description of “man, face with big nose.” Well, what one person considers big in general is different from another person’s perception of big. A third person’s interpretation of the word would be different still—stripping it of any and all significant meaning in the grand scheme of swiping for a blind individual. Moreover, “big” is already confusing, so just add “nose” to it and the tables unpredictably turn once again. Even if two people agree on the definition of big, one person could view a picture of a nose as big, while someone else could view the same picture as average. This is because, despite the common language we speak, the way we perceive reality differs from person to person. My mental image of someone before I meet up with him for the first time comes together in the form of sporadic and often unintentionally inconsistent descriptions provided by a bunch of my friends, which I sort through to find some kind of common denominator. Also, huge shout out to my friends for always being so patient and never refusing to describe—it means the world to me! Combine that with the more-often-than-not blank bios, and I am basically where I started when I first swiped right. This is just one of many parts of Tinder that make this already crazy dating world much more of a conundrum for me. Wait, are you really blind? No, I lied… because someone would be messed up enough to lie about that. Hey! I’m not trying to be mean. You seem like a great girl, but how would this work if you can’t see? First of all, that’s like saying no offence and still saying something offensive. Second, clearly it won’t. I can’t “see” us working with that kind of attitude. I just wanted to say that you’re so inspirational, and I hope you have a great day! I don’t need the pity party if you’re not actually going to talk to me. Thanks, but no thanks. Hi, so your friends technically swiped on me? So I would technically be dating your friend not you? So what was the point of this message, just go date all 500 of my friends who described you. I don’t believe that you’re blind… how do you rock climb? I don’t have to prove anything to you… and how do you? Guy: Btw, do you have snapchat? Me: So I’m guessing you didn’t read my bio? Guy: What, what does snapchat have anything to do with your bio? Me: Well, if you’d read it you’d know. Lol I can’t see. These are not by any means the majority of the conversations I have with people on Tinder. It’s just that when they happen they are pretty discouraging. But, I always remind myself that I wouldn’t date someone who wasn’t accepting of others, even if I could see. I also do not expect too much from Tinder, an app that became popular and most known for its one-night-stands. Although things are slowly changing and guys are getting classier by the day, I believe that the best relationships come when you least expect them. Maybe I’m just a hopeless romantic stuck in a generation of people who are more scared of commitment than they are of dying, or maybe I haven’t yet found someone for a different, more promising reason. Either way, that’s my experience, and for the most part people are pretty accepting and excited to talk to someone who has a different perspective of the world. Thankfully, most of the dates that I’ve been on have been fun, classy, and natural, and I wouldn’t have it any other way. I’m just a girl trying to do this online dating thing, and minus its flaws (like anything in life), so far, it’s been better than I expected.